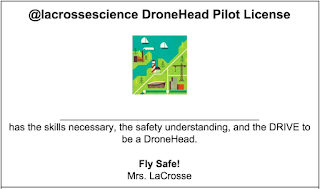 Conversations: Learning and Growing: Becoming a DroneHead Pilot in @lacrossescience in a few easy steps! 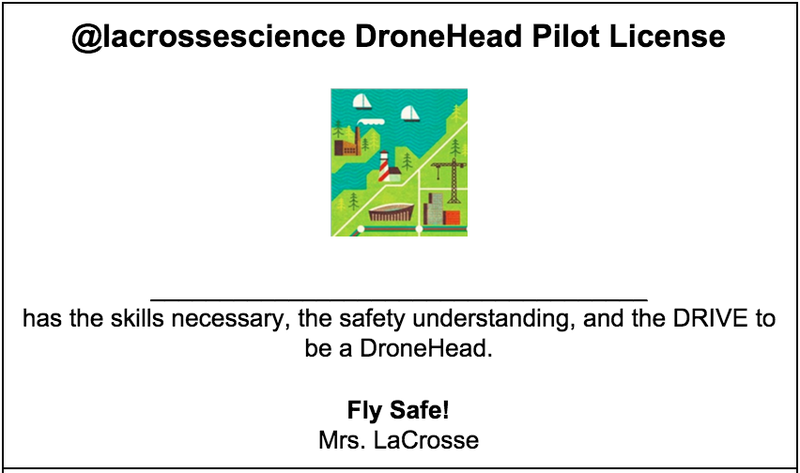 Becoming a DroneHead Pilot in @lacrossescience in a few easy steps! Tracking the environment of our local estuaries- We are exploring how the weather and rainfall are affecting our favorite estuary, Old Woman Creek. Our drone buddy, Jon Jarc helped us capture some beautiful early fall footage. Now, we are ready for some winter(ish) views of the estuary! Exploring physics principles from above- Students are going to capture various forces and motion investigations from above. Grabbing overhead footage of objects in collision may be the ticket to helping some of my students understand the concepts that we are exploring. Conducting some investigations- Speed and acceleration, baby! That's the ticket! I'm sure that we have plenty more coming...but, this is what's on my mind right now. First, watch a short video about drone safety with Jeff Dunham and Bubba J. Then, hop onto the FAA site for some safety regulations! After you have passed the written test, get ready to PRACTICE, PRACTICE, PRACTICE! Your hands-on test is right around the corner. So, learn how to start up, land, practice speeding up and slowing down, and more. The students that are embarking on this journey have a wicked cool license waiting for them. I love how you and I are going about training drone pilots in such different ways.